Indian automobile giant – Tata Motors and leading Indian tyre manufacturer- CEAT Ltd. have together announced a partnership today to bring a customer loyalty program called “Tata Delight” for commercial vehicle owners. 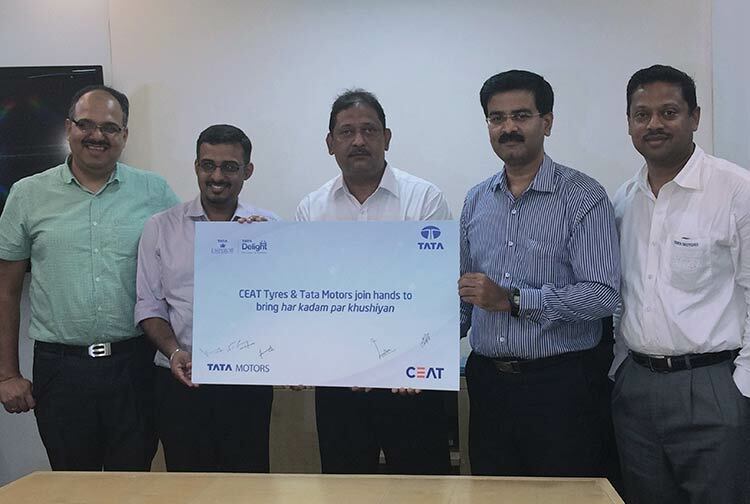 The partnership between CEAT and Tata Motors would enable its members to earn reward points with loyalty benefits on every purchase of CEAT tyres for Tata Motors’ wide range of commercial vehicles. Tata Delight – Loyalty Program members could redeem points accumulated against the purchase of CEAT tyres, at authorised dealerships using the discount vouchers which is sent to them. We are glad to be a part of Tata Motors Customer Loyalty Program – Tata Delight, which offers a host of benefits to our customers. We at CEAT have always believed in taking additional steps to achieve customer satisfaction and this association will further help us connect with our customers. We at Tata Motors Ltd. thrive upon making the journey of our customers delightful and through this association we are happy to have strengthened our offering in Tata Delight. It is indeed inspiring to see CEAT Ltd. coming forward and associating with us in this journey. CEAT Ltd. and Tata Motors are known to set high standards of customer satisfaction and as a team, we hope to exceed all our customer expectations.